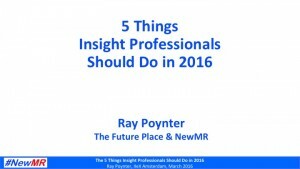 Earlier this month, I shared my 5 top tips for things I think market researchers should do in 2016, as my closing keynote at IIeX Amsterdam. These tips were both a response to the ideas presented at the IIeX Conference and also a general view of the challenges and opportunities in 2016. In 2015 the talk was about the need to be device agnostic, i.e. the need to make sure that research exercises, for example surveys and online discussions, worked on PCs, tablets, and smartphones. Whilst that is still true today, the focus has shifted and is continuing to shift from device agnostic to smartphone. With a few exceptions, in 2016 mobile first is the key design element. Start by designing research so that it will utilize and work with a smartphone, and as a second consideration assess whether and how it can also be configured with tablet and PC. In most cases, it is straightforward to ensure research can also embrace tablet and PC, but not if location, push notification via beacons, the use of apps, or the collection of in-the-moment information is a key part of the research. One of the big trends that is taking place at the moment is customer centricity – as evidenced by the popularity of Denyse Drummond-Dunn’s new book Winning Customer Centricity. This trend should also be true of market researchers and the users of market research, e.g. the insight managers, the brand managers, and the many other users of research. When I talk to the users of market research they typically tell me that researchers contact them too rarely, ask too few questions, and very really contact them when not being paid to contact them. Techniques like storytelling and agile research require the researcher to have a good understanding of the research users, and that requires spending time talking with the users of research. One of the biggest shifts, over the last few years, in our understanding of people and their behavior has been the realization that people are feeling machines that think, not thinking machines that feel (to paraphrase Damasio). This finding, which is at the heart of behavioral economics and neuroscience-based research, has shifted the focus towards emotion and away from ‘facts’. The most important technology in 2016 will be the smartphone; the most important driver of new research approaches will be emotion. In terms of your personal development, you are either going forwards or going backwards. My recommendation (and something I do myself) is to learn a new something each year. In most cases it does not matter too much what that something is, the key is to add additional perspectives, increase the size of the toolkit you can apply, and to keep you fresh. Recent examples from researchers I like and respect include: learning coding, learning R, taking a course on semiotics, attending an improv course, and studying the ukulele. Taking a leading role in the automation of tasks, rather than being the one automated. Enhancing your people related skills (for example, presenting, client management, staff management, coaching, and teaching). Being a user of automation, increase your productivity and usefulness by utilising the automation that exists around you and by introducing new automation tools when they appear. Focusing on things that are hard to automate, for example consulting and one-off, bespoke projects. I have to say I find #NewMR consistently intensely relevant and useful and try not to miss any of the webinars. Regarding the above piece, I would however say that the burgeoning ‘faster cheaper (and not necessarily deeper or more useful)’ approach that currently makes up mobile & to a lesser degree online, has not impacted on my own qual work which requires regular contact with senior decision makers and the hard to reach through F2F and teledepths. In that respect, this tried and tested methodology is very much still alive – no hint of being a loser, not yet at least. Agreed, it is but one tool in the toolbox but is so often required. I forget who it was who wrote recently about the ‘complexity and sheer messiness of qualitative data collection & analysis’. Hosts of variables impact the final outcomes and automation has a very long way to go to overcome this, at least in qual.